Gurudev Siddha Peeth is an ashram run by the Gurudev Siddha Peeth Trust and it is an advanced university of Siddha Yoga. It is the original ashram of Swami Muktananda, one of the most prominent Eastern teachers to come to the West. The ashram is located between the tiny villages of Ganeshpuri and Vajreshwari, seventy miles north-east of Mumbai. The ashram's origins date back to the guru known as Bhagavan Nityananda, who had been in the nearby village of Ganeshpuri. Before he died in 1961, he told his devotee, Swami Muktananda, to build an ashram near Ganeshpuri. Swami Muktananda brought his teachings to the west. He traveled around the world giving teachings; published books, gave shaktipat to his devotees,founded ashrams and meditation centers across the the United States and Europe. Today, tens of thousands of people are students of Muktananda's successor, Swami Chidvilasananda. Known to devotees as Gurumayi, she guides students spiritual practice and study. She, presiding over five hundred fifty meditation centers and more than ten ashrams around the world. She teaches shaktipat to tens of thousands of devotees every year. The Ashram is set up in a fenced -off campus whose loccked gates are monitored by guards. Inside the ashram complex, there are green and peaceful, with meditation flower gardens adorned with statues of Indian deities. The buildings has dimly lit meditation halls, Sanskrit chanting croons from speakers. Visitors are welcome to pay their respects at Muktananda's peacock feather- lined samadhi shrine and the temple to this guru, Swami Nityananda. The Ashram is reserved for those students who want to go a deeper of Siddha yoga. The students are given practice and are guided accordingly. He/she must apply at least three months in advance to be vetted for a one month minimum stay. The word 'Siddha Yoga' is derived from Kashmir Shaivism, a school of Hindu thought. In Siddha Yoga, self realisation is achieved through the awakening of the intense spiritual energy called Kundalini Shakti which lies coiled and dormant at the base of the spine. Siddhayogis around the world perform the practices and study the teachings in Siddha Yoga meditation centres and ashrams, in chanting and meditation groups. There are learning and teaching events and retreats as well as sadhana support tools available to aid seekers in their journey. The yoga program offers training in meditation, hatha yoga and mantra and courses in Indian philosophy and scripture. The ashram schedule includes meditation and devotional chanting and long hours of seva (voluntary work). The ashram's charitable activities include the Muktananda Mobile Hospital, which treats more than 40,000 patients each year in over 150 villages; and four eye camps, which perform free or low cost cataract surgery. The schedule includes daily meditation, yoga, lectures and courses. 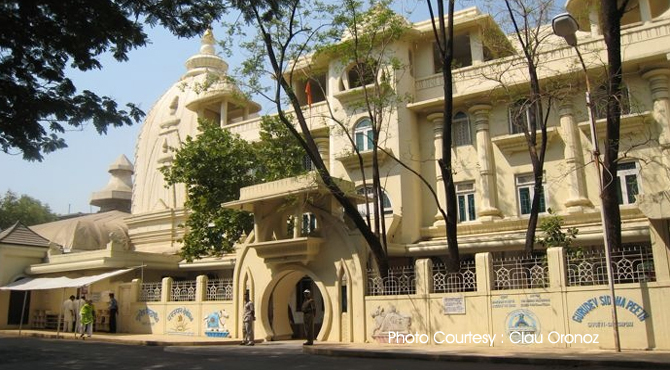 The Nityananda Temple and Muktanda's samadhi shrine are open to the public 7 am to 12 pm and from 3 to 6.3- pm. October to March is the best time to visit; summer and monsoon season in this region are apt to be uncomfortable.